As an example we will develop a web form that acts as a data entry page for Employees table of Northwind database. We will a web service that will allow us to SELECT, INSERT, UPDATE and DELETE employees. This web service will be consumed our data entry page using ASP.NET AJAX features. To begin with, create a new web site using Visual Studio 2005. 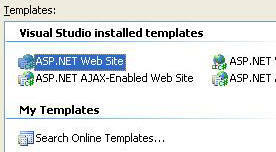 Notice that installing ASP.NET AJAX will add certain project templates to the New Web Site dialog. The Figure 1 shows the New Web Site dialog with the templates I just mentioned. Of course, you can modify a normal web site to make it AJAX enabled but this template simplifies your job. Now that you have created a new web site, add a new web service to it and name it as EmployeeService.asmx. The EmployeeService will contain five web methods. These web methods are mentioned in the following table. The Employee class declares three provate variables for storing employee id, first name and last name respectively. The three variables are wrapped inside three public properties namely EmployeeID, FirstName and LastName. Here, we store a database connection string that points to the Northwind database. Make sure to change SQL Server name/IP and authentication details to match your environment. The code reads the connection string from the config file using ConfigurationManager class and stores it in a class level variable called strConn. This variable is used further by all the other web wethods. The code creates a new SqlConnection and SqlCommand objects. It then executes a SELECT query and fetches EmployeeID, FirstName and LastName columns from Employees table. The results are retrieved as SqlDataReader instance. Then a generic based List of Employee objects is created. A while loop iterates through the SqlDataReader. 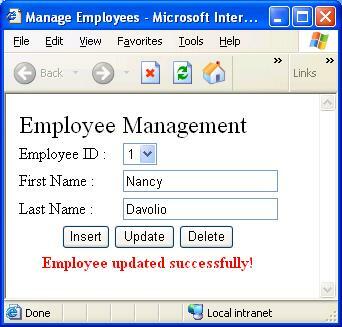 With each iteration a new Employee object is created and its EmployeeID, FirstName and LastName properties are set. The Employee object is then added to the List. After the while loop is over, SqlDataReader and SqlConnection are closed. The return type of GetEmployees() web method is an array of Employee objects. Hence, the generic List is converted into Employee array using ToArray() method of List class. The GetEmployee() web method accepts an employee id that is to be returned. The code is very similar to what we discussed earlier but this time it fetches only one employee. Note that we have used SqlParameter to represent the passed EmployeeID. 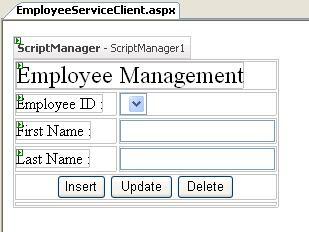 The Insert() web method accepts first name and last name of the employee to be added. It then creates an instance of SqlConnection and SqlCommand each and execute the INSERT statement using ExecuteNonQuery() method of SqlCommand object. Similarly, the Update() web method accepts employee id to be updated along with new values for first name and last name and fires an UPDATE statement. Finally, the Delete() web method accepts an employee id that is to be deleted and fires a DELETE statement. That's it! We are now ready to consume our web service from ASP.NET AJAX. How to consume web service? In this section we will create a web form that acts as a data entry page for the Employees table by consuming the web service we just created. To being, add a new web form called EmployeeServiceClient.aspx to the web site. Open the toolbox by selecting View > Toolbox menu option. On the toolbox locate a node titled AJAX Extensions. The Figure 2 shows this node. 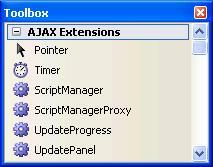 The AJAX Extensions node displays all the ASP.NET AJAX components that you can use on a web form. Drag and drop a ScriptManager component on the web form. Every web form making use of ASP.NET AJAX needs one ScriptManager component. Open the properties window for the ScriptManager. 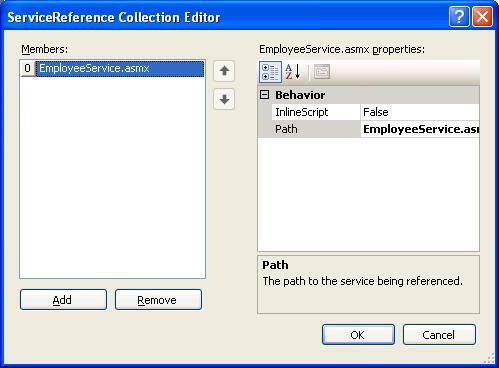 Locate its Services property and open Service Reference collection editor as shown in Figure 3. Click on the Add button at the bottom of the dialog and set Path property to the virtual path of the web service i.e. EmployeeService.asmx. Doing so will generate the following markup in the web form file. For each web service that you want to consume there must be one <asp:ServiceReference> element inside the <asp:ScriptManager> section. The <asp:ServiceReference> tag registers a web service to use in the current web form. Now design the web form as shown in Figure 4. The TimeOutHandler() function is called whenever a web method times out. It simply shows an alert to the user. The ErrorHandler() function is called whenever there is any error. The result parameter received by this method provides three methods viz. get_exceptionType(), get_message() and get_stackTrace(). These three methods return the type of exception, detailed error message and stack trace respectively. The ErrorHandler() function simply displays an alert to the end user. Now that we have developed the web service and the client application, it's time to test them. Run the web form and try inserting, updating or deleting employees. The Figure 5 shows the web form after updating an employee.